We have a fig tree overhanging our parking lot. I don’t like figs, so in previous years I would just mutter a few uncomplimentary things about figs as I would try to walk through the parking lot without getting crushed fig on my shoes, which is sticky beyond belief. This year things were different. First, my son likes fruits I don’t. Maybe he likes figs? Second, my parents love figs and are even crazier about fig jam. Third, isn’t it a pity? Figs (and organic figs, at that) are rare and expensive. Isn’t it a pity to leave them to be crushed under cars and eaten by strange and exotic insects? I decided to taste one, just to make sure I don’t like figs. Aaah what sweetness! 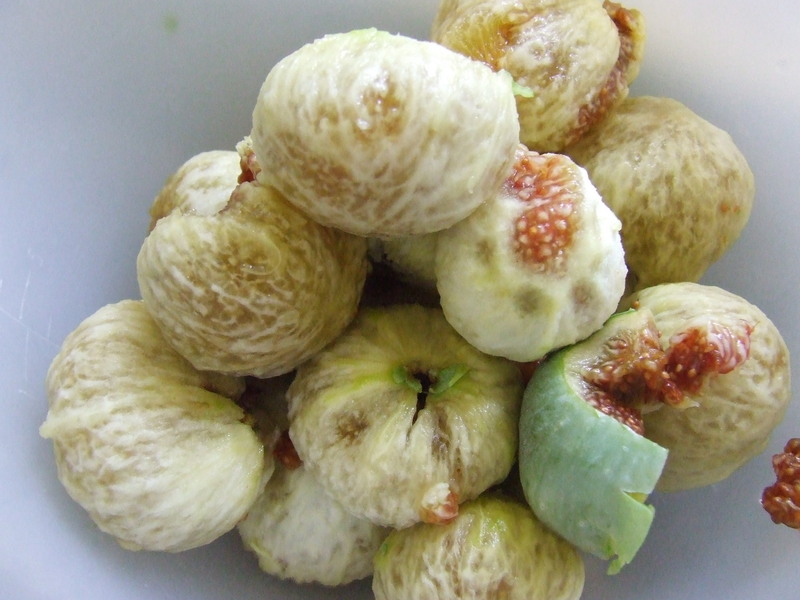 I discovered that I love fresh figs, and I mistakenly thought that dried figs had any connection to figs off a tree. I don’t like dried figs at all. But fresh – this was like eating pure honey with a crunch. 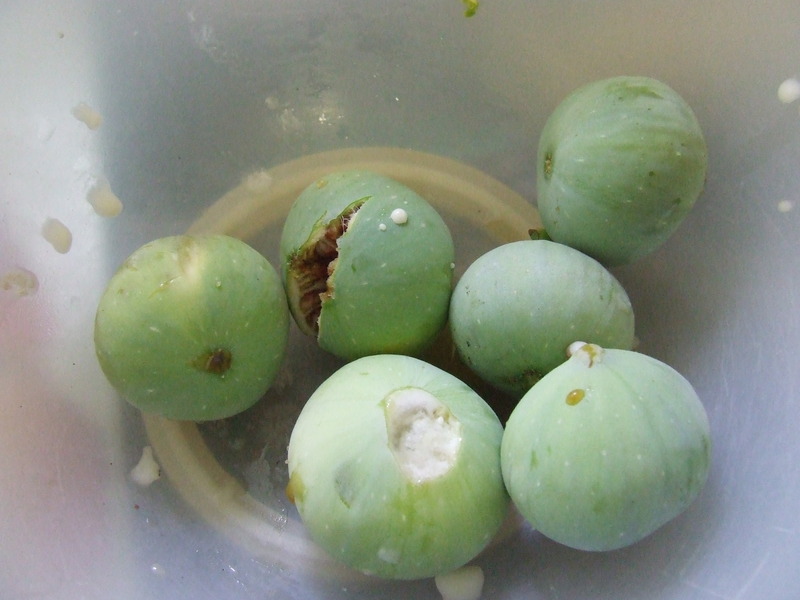 So I took a small step-ladder and spent a few minutes picking figs. 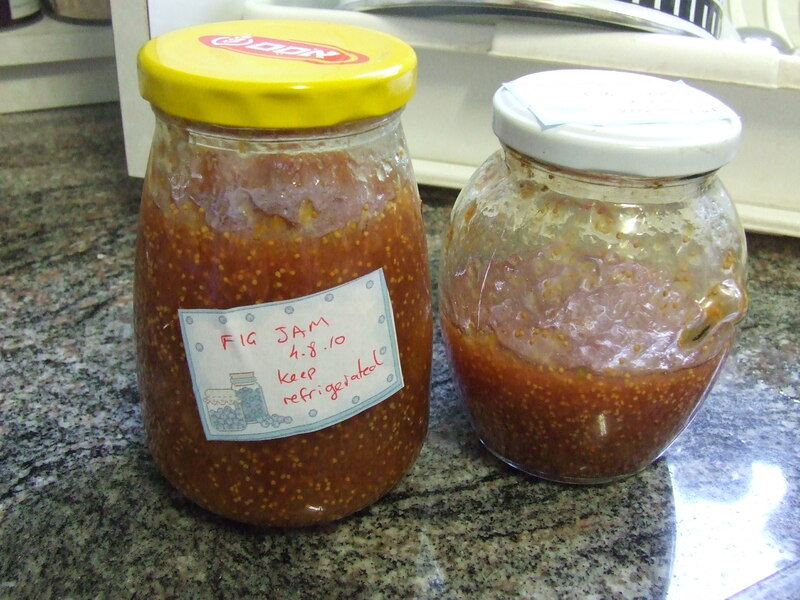 I put some aside to give to my kids and parents, and with the rest I made fig jam. My parents are crazy about it, even going to the point of buying some from a local coffee shop at an exorbitant price. I’m OK with fig jam – I mean it’s tasty and all, but it doesn’t compare to apricot or strawberry jam in my opinion, but it tastes good. I looked round the Internet a bit to find a good recipe. My in-laws bought me some Dr. Oetker’s Gelfix from Germany (it contains pectin) but the instructions were all in German 😦 . So I tried to find the instructions on the Internet as well. (Of course, I could have called my mil but then I would have had to bring her the box and I was a little short on time. Besides, the Internet has everything). * some recipes didn’t peel, or only peeled the thicker peels, or soaked the figs in boiling water for 10-15 minutes to soften the peel. I just peeled it – the type I have in the parking lot has rather thick peel that’s easy to remove. Mix everything together in a large pot. Bring to a boil. Crush if you like (I use a potato masher. You can also slice the figs in advance, but it’s really not worth the trouble in my opinion). Boil for 4 minutes. Check if jelled enough for your taste (see note). Pour into clean glass jars with an airtight lid. Turn upside down to cool. I had 1 1/2 jars, so I gave the full jar to my parents, and kept the half jar for myself. I barely got to most of the fruit on the tree though, so today I got hold of some neighbors and told them that if they’ll bring me figs, I’ll make jam for them. Why waste? 1. 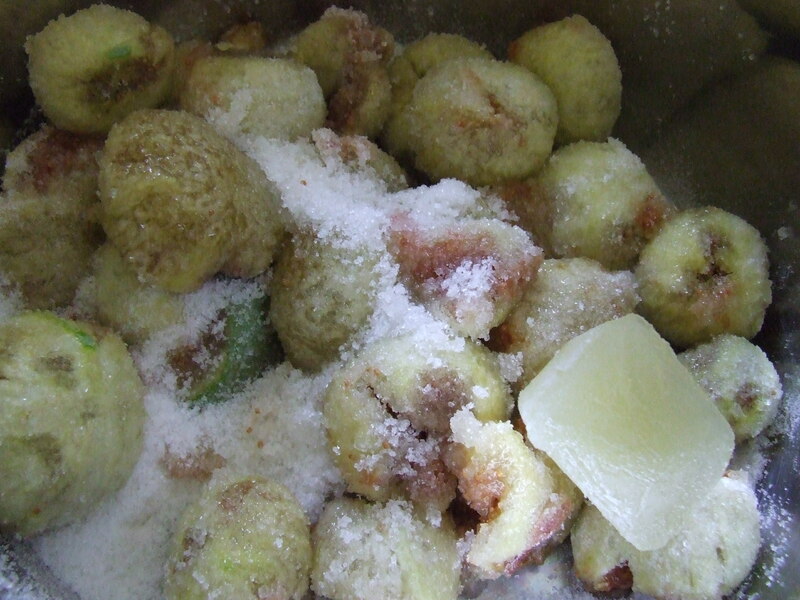 To check if jam jelled: keep a small plate in the freezer (empty). When you want to check the jam, take it out of the freezer and place a spoonful of jam on it. Wait until it cools to room temperature (a few seconds) and run a finger through the jam. If it closes over the trail, it is not ready. If it doesn’t it is. 2. If you want the jam to keep for longer than a few months you need to sterilize the jars by boiling jar and lid for at least 10 minutes. If you intend to eat within a few months, clean jars ar enough, but keep refrigerated. If mold shows up on your jam, throw it all away, don’t just remove the moldy part, as the mold secretes poisonous substances into all the jam. If mold shows up after less than a month, start sterilizing your jars even for short-term storage – maybe the type of jar or implements (or fruit) you’re using is more susceptible to mold. 3. If you don’t have pectin, you can add some more fresh lemon juice, or lemon pulp (without the seeds) or the core of an apple in some cheesecloth (so you can remove it easily and the seeds don’t get into your jam). Citrus fruit and apple skin and cores are a great source of pectin. This usually needs more cooking time – minimum 20 minutes and usually more, at a lower heat. The jam should simmer, not be at full boil. Check every 10 minutes if jam jelled. 4. 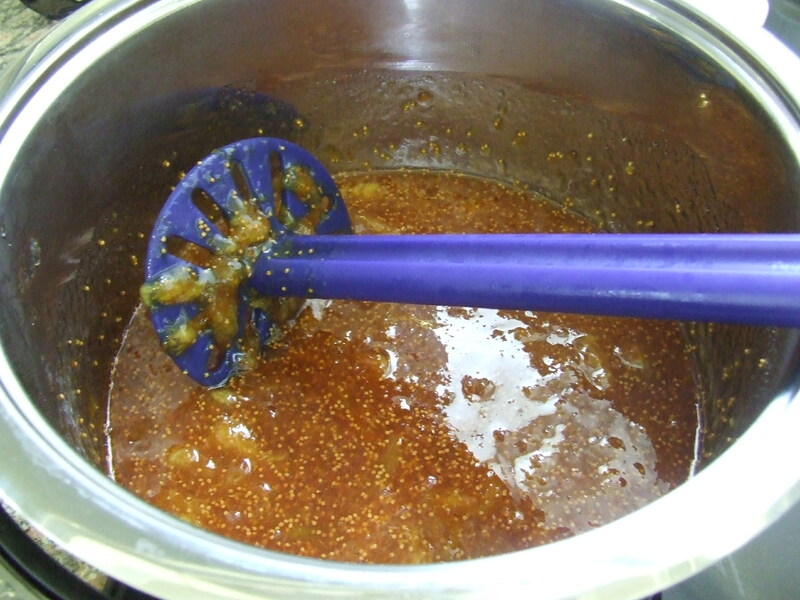 Turning jars upside down: This causes a vacuum while cooling, promising that the jam will keep longer. To be foolproof, boil the jars with the jam in them for 5-10 minutes. Jam made with sterilized jars that were boiled afterwards with the jam keep for up to 18 months. 5. Labels: I printed great jam labels at graphic garden. Unfortunately, my son doesn’t like figs in the end, but I don’t mind… more for me!